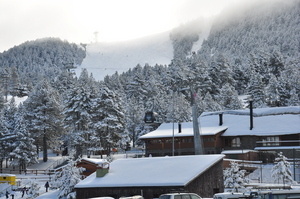 Is it snowing in La Molina ?¡Gracias! La Molina is well-situated, surrounded by mountains of more than 2500 metres. 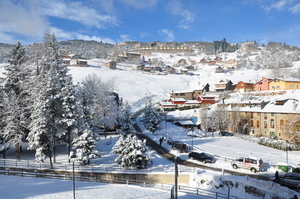 La Molina is the nearest ski resort to the main cities of Catalunya and large parts of Spain. It is readily accessible by car, bus, or train. After nearly one hundred years of operation, La Molina has the experience to maintain its position as one of the premier ski resorts of Spain offering the newest technology and services. Recent expansions were engineered to respect the environment and the needs of the customers. As a result La Molina has received the awards ISO 14001 for the Natural Environment and the "Q" of Tourism Quality. I go there regularly with my 6 year old son. It's a medium sized resort (68km of slopes) and offers great skiing for beginners to intermediates. If you want more of a challenge, take the Telecabina to Masella (just on the other side of the mountain) for a bit more spice. Only 2 hours from BCN or Girona. You could easily spend up to 3 days there and not get bored. Not much nightlife though, you go there for the sport. (if you want bars & pubs the towns of Alp & Puigcerda are closeby). 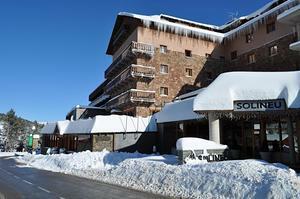 Many ski-schools and rental companies to choose from. Another plus: much less expensive than France, Austria or even Andorra.